Click on logo above left for trip details. For the past several years we have looked forward to the "Winter Finch Forecast" put together by Ron Pittaway, founding life member of Ontario (Canada) Field Ornithologists. Based on his own observations and data collected by scores of outdoor observers from Manitoba east to Canada's maritime provinces, Ron analyzes weather and each year's wild seed crop before predicting which species are likely to remain in Canada or bail out for better mid-winter pickings in the continental U.S. This year in some parts of Canada cone-bearing trees made few seeds while Spruce Budworm larvae and some berry crops were in decline because of drought, indicating a significant lack of food for many bird species during the coming winter. Ron surmises there could be an influx of Purple Finches and that we might even look for Common Redpolls and those ever-elusive Evening Grosbeaks. 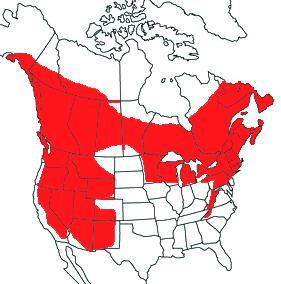 He also noted a widespread midsummer "irruption" (i.e., an unusually large influx) of Red-breasted Nuthatches across the U.S. (map of breeding range above left), so when we started reading reports of this species being seen in Pickens County as early as the last week in August 2012, we logically wondered if we'd get any here at Hilton Pond Center. The answer, were pleased to say, is this week, when we had an "irruption"--of one. Indeed, as we were running mist nets on the afternoon of 9 October 2012 we extracted an immature male Scarlet Tanager, a female Red-bellied Woodpecker, and four Swainson's Thrushes. The tanager was nice to see (green body and jet-black wings) and we enjoy the opportunity to get up-close looks at any woodpecker, while the thrushes were part of nearly two dozen of their ilk to be captured locally so far this fall. A little later we figured a hatch-year female Mourning Dove would be the last bird of the afternoon when suddenly we noticed the mist net just ahead of us moving despite the absence of wind. As we got closer we looked into the top shelf of the net about seven feet off the ground and saw the bird we had been waiting for--a brilliantly colored Red-breasted Nuthatch (above). We removed the little bird easily and brought it inside the old farmhouse for measurements and banding, after which it was back outside to admire this northern invader through the camera lens. Nuthatches have always been among our favorite North American songbirds. They do some things so differently from most birds--including walking briskly down tree trunks with their heads aimed toward the ground--that they attract immediate attention and have an appearance and other habits that make them easy to identify, even for beginning birders. One of our most memorable natural history experiences came back in the mid-1970s when--on a winter field trip with our high school students--we encountered a small tree in which we simultaneously observed all three eastern nuthatch species--White-breasted, Red-breasted, and Brown-headed. The rare tableau was like a painting from a field guide and gave us unique opportunity to point out the species' differences and similarities. We don't get many White-breasted Nuthatches at the 11-acre Hilton Pond property (our old hardwoods are probably too few and scattered to support more than a pair, so we've banded only 20 through the years), and our Brown-headed Nuthatch population more or less crashed after 1994 when a neighboring farmer clear-cut 60-plus acres of lumber-grade Loblolly Pines that were a haven for this southern species. (We banded 27 brown-headeds 1984-94, just 21 in the next 18 years.) Red-breasted Nuthatches are a whole 'nother matter, with a mere one dozen banded from 1985 to the present, counting this week's bird. Most years we get none or one, with November 2007 bringing an unprecedented total of THREE in a two-week period. Talk about a real irruption! And here's some further info Audubon didn't mention about the cavity nest of Red-breasted Nuthatches. An adult pair typically coats the area around the nest opening with pine pitch or other sticky sap--an adaptation that supposedly keeps out insect pests, predatory squirrels, and competing birds. 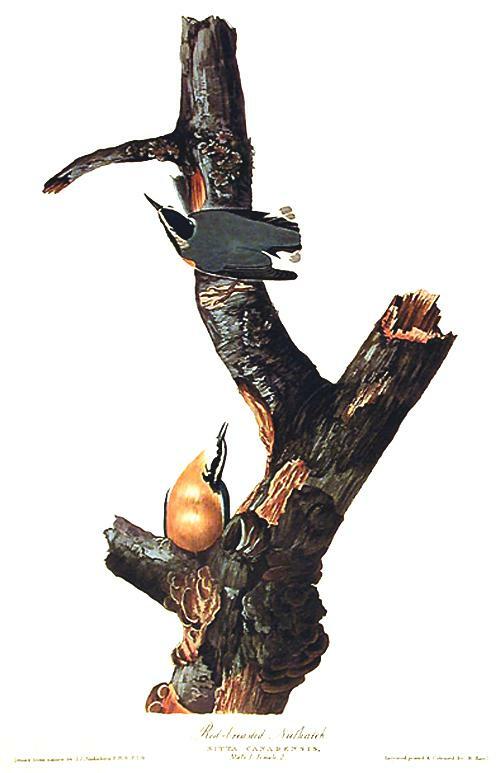 Nuthatches themselves avoid the mess by flying directly into the hole without landing on the surrounding tree trunk. Red-breasted Nuthatches occasionally occupy artificial nest boxes, particularly those with "chickadee-size" holes of 1-1/8" diameter. The nest box entrance will get its requisite smearing of sap, making it less attractive to chickadees and wrens after the nuthatches take up residence. Incidentally, the nuthatch pair sometimes keeps mandibles clean by using pieces of bark to spread the pitch--a nice example of tool use in birds. We should point out that although Red-breasted Nuthatches, Sitta canadensis, are an "irruptive" species whose scientific name indicates a more northerly breeding range, it's entirely possible at least some we capture at Hilton Pond Center are from a population that breeds at higher elevations down the Appalachians into North Carolina. 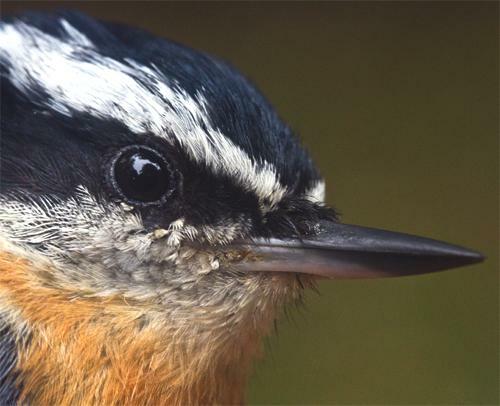 In 2003 Frank Renfrow even documented a Red-breasted Nuthatch nest for South Carolina. Within Chattooga Recreation Area in upper Oconee County, the cavity was in a dead snag on a live Sweet Birch tree and--as expected--was adorned with pitch from nearby White Pines. Among Red-breasted Nuthatches the sexes are nearly monomorphic externally, with males (above) typically having darker, more uniformly colored caps; the female's crown is a tad more gray. 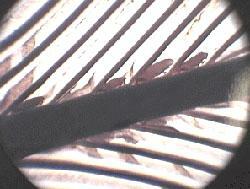 Older birds usually have much brighter breasts, bellies, and undertail coverts (below). 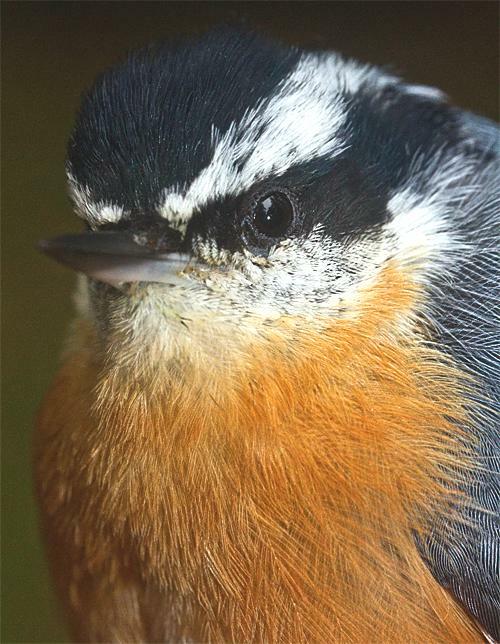 Those prominent white tail spots visible in both photos are found in all ages and sexes of Red-breasted Nuthatches. 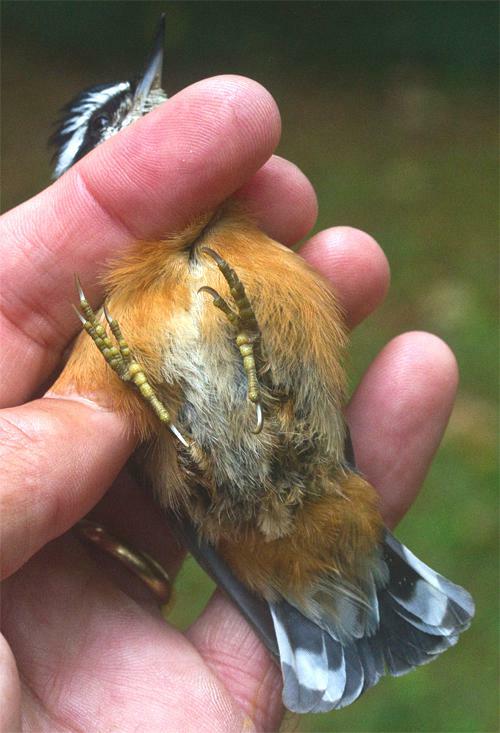 We've always been fascinated by the diversity of birds' feet, and the walking appendages of Red-breasted Nuthatches are no exception. 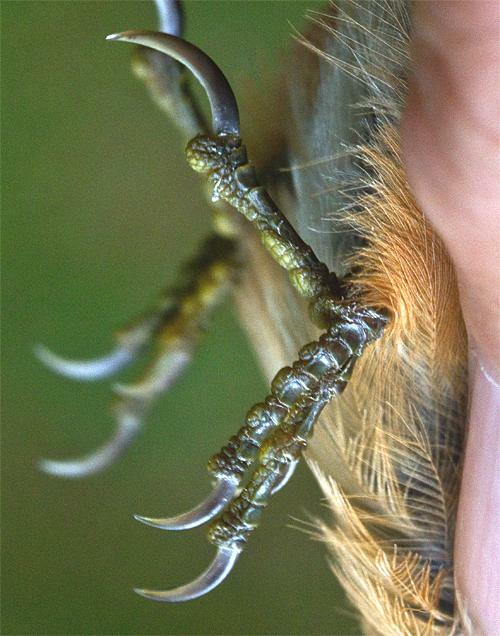 The claws on each toe are almost raptorial (above), but instead of being adapted for grabbing and holding prey they enable a nuthatch to cling to bark as it searches for insects. We flipped the photo to emphasize the especially long hind toe and claw--which together allow the nuthatch to move head-down on tree trunks. We're also intrigued by the bi-colored, almost boat-shaped bill of the Red-breasted Nuthatch, shown in our final mug shot above. The upper mandible is almost perfectly straight, while the underside of the lower curves upward. We suspect this configuration allows a nuthatch to slide its bill beneath loose bark it then pries away from a tree to reveal a tasty insect, spider, or other invertebrate. (They're especially fond of earwigs.) The sharp, pointed bill tips are just what the bird needs to grab even a tiny prey item. The bill is also adapted to extract seeds from between scales on conifer seeds, and at our winter feeders to take sunflower seeds one at a time before opening them or--as is more often the case--caching them in a bark crevice. One of the neat things about banding birds is it allows us to examine our captures and photograph them as above to see what isn't easily observed at feeding stations or through binoculars. 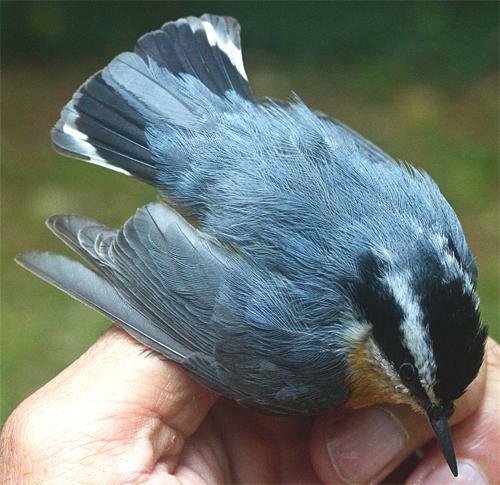 Irruptive species or not, we're hopeful we'll catch additional Red-breasted Nuthatches this winter at Hilton Pond Center so we can learn--and share--even more about these irregular migrants from up north. --We had our most diverse banding period of the year this week at Hilton Pond Center, with 70 birds from 23 species; many were fall migrant warblers we'll not see again until next spring--or while we're in the Neotropics this winter mist netting hummingbirds. The week's locally rarest bird was that little Red-breasted Nuthatch--only our 12th-ever (see photo essay above). Curiously, we also caught our 19th and 20th WHITE-breasted Nuthatches. Least common parulid was a Palm Warbler, of which we've caught just 57 in 31 years. --We did reach one milestone this week when a Swainson's Thrush netted on 8 Oct became the 58,000th bird banded at Hilton Pond Center since 1982. Frankly, that's a LOT of birds! --If you missed last week's photo essay it was about an American Goldfinch banded at Hilton Pond and found dead in far-off New York state after dying of West Nile Virus. See Installment #553.